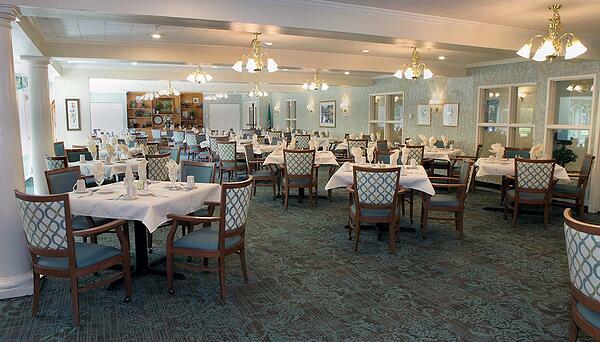 At Village Green our residents enjoy dining prepared by a highly trained staff under the guidance of our own Chef. We focus on bringing a wide variety of menu choices tailored to the preferences of our residents. Our residents will always find a variety of menu items to suit their taste. We work to ensure that special dietary needs for each of our residents are met. All of our foods are prepared with a minimum amount of salt and sugar-free desserts are offered at every meal. You will be able to dine with us knowing that your nutritional requirements will be met each day in a menu designed to be healthy, delicious and full of choices. All of our meals are served restaurant-style so residents have the opportunity to socialize with friends in one of our many intimate dining areas. Check out Sample Menus.